There are very few movie franchises on the planet that are popular enough to warrant a massive, annual celebration, but Star Wars is one of those franchises. Now that we are getting new Star Wars movies, shows, books, comics and games on a regular basis, Star Wars Celebration has become an even more essential event for fans of a galaxy far, far away. This year is particularly special, as it marks the 40th anniversary of the original Star Wars and it has been revealed that the event this year will kick off with a special panel celebrating the four-decade legacy of the franchise. StarWars.com made the official announcement, saying that the very special tribute to the 40th anniversary of Star Wars will kick start Celebration Orlando, Florida this year. Warwick Davis, who played Wicket the Ewok in Star Wars: Return of the Jedi as well as several other characters in the Star Wars movies since, will be hosting the panel, which will be taking place on Thursday, April 13. The panel will be headlined by Lucasfilm president Kathleen Kennedy and will also feature some of the saga's "brightest stars", though no specific guests were announced. The announcement of this panel also featured a delightful little tease which implies this is an event Star Wars fans simply can't miss. "This marquee Celebration event will undoubtedly include many not-to-be-missed surprises. So set hyperspace coordinates accordingly..."
In addition to announcing the 40th anniversary panel, the official poster for Star Wars Celebration 2017 was also revealed. The poster was done by artist Paul Shipper and beautifully unites all three generations of the Star Wars franchise in one epic shot. 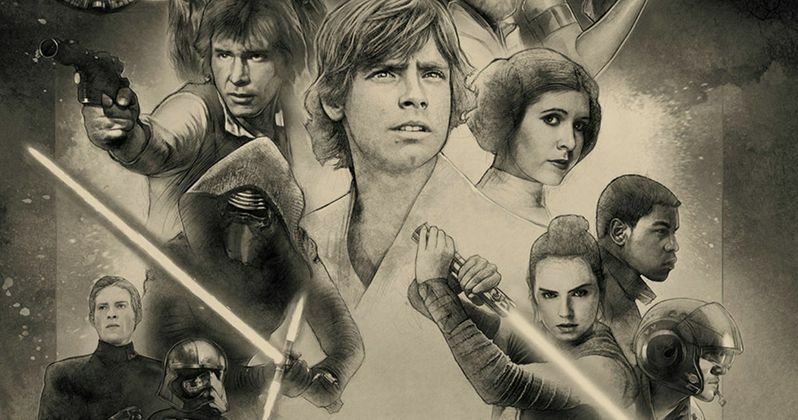 The black and white poster is very much done in classic Star Wars style and it even makes the prequel era characters look pretty cool when placed next to the franchises more universally loved icons. Last year's Star Wars Celebration wound up being something of a disappointment when it came to big announcements. The Star Wars Rebels panel delivered in a big way by revealing that Grand Admiral Thrawn was being brought into the new canon, but movie announcements were pretty slim. The "big reveal" for the weekend was hardly a reveal at all, as Disney and Lucasfilm officially announced that Alden Ehrenreich would be playing Han Solo in the upcoming untitled Star Wars anthology movie, which was the worst kept secret in Hollywood at that point. Many were upset that no Star Wars 8 news broke and that there wasn't a new trailer for Rogue One: A Star Wars Story, though, they did release an excellent behind-the-scenes reel. It looks like Disney and Lucasfilm are not planning on making that mistake this year, as they are already teasing some big surprises at this 40th anniversary panel. Not only that, but it is suspected that the very first teaser for Star Wars: The Last Jedi will debut at Celebration this year. The panel for the highly-anticipated follow-up to Star Wars: The Force Awakens will be taking place on Friday, April 14, so be sure to mark that down on your calendars as well. Star Wars Celebration 2017 takes place in Orlando, Florida from April 13-16 at the Orange County Convention Center. Tickets for the event are still available at StarWarsCelebration.com. Be sure to check out the brand new poster for this year's Star Wars Celebration for yourself below.